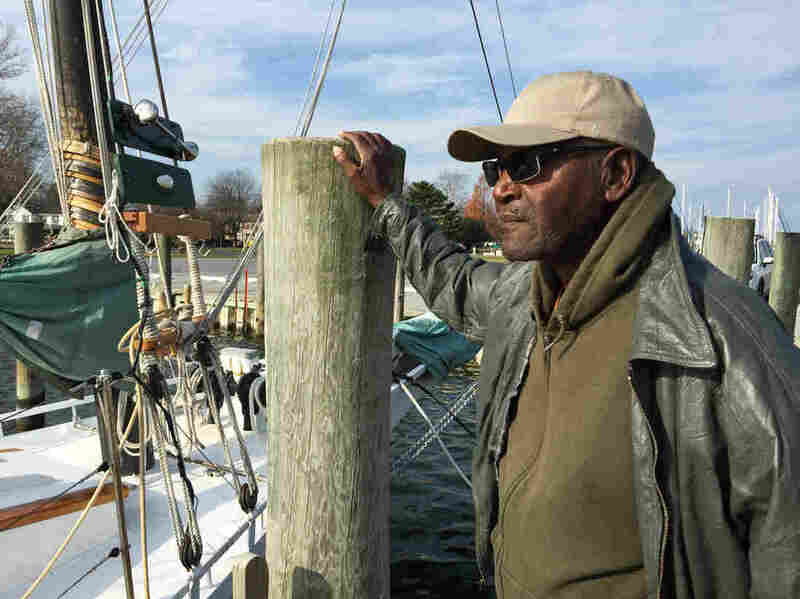 A Captain On The Chesapeake Bay, 'Lost' Without A Skipjack Kermit Travers, 78, one of the last African-American skipjack captains, reflects on his nearly 60 years harvesting oysters on the Chesapeake Bay. Capt. Kermit Travers is one of the last African-American skipjack captains. The nearly 60 years he has spent on the water have been without a life jacket — even though he can't swim. For centuries, Chesapeake Bay oysters were harvested by skipjacks, those tall, sleek, singled-masted sailboats. The skipjacks are mostly gone now, replaced by more efficient, less majestic ways of fishing. But one skipjack captain refuses to fade away. Kermit Travers, 78, is one of the first and last African-American skipjack captains. He's been sailing the Chesapeake for most of his life. "If this boat right here could talk right now, this boat would tell you all about me," Travers says. He loves the water, he says. "[I]f I couldn't see a skipjack around I think I'd be lost." Click the audio link to hear him reflect on his life on the water.